Father Jenkins, Provost Burish, Dean Carlson, distinguished faculty, staff, family, and friends, and especially members of the Notre Dame graduate class of 2016. It is an honor to participate in this, the 84th Graduate School commencement. I have been involved with higher education for decades, and have participated in many commencement ceremonies, but I am always delighted to see the joy, excitement and pride of new graduates and their loved ones. First, allow me to extend my congratulations to the graduates and their families. This is a proud moment in all of your lives. You have worked hard to be here today and it is just the beginning of the next step in your careers. You, like the Graduate School of the University of Notre Dame, have come far. Since its founding in 1932, the Graduate School has grown from offering two Ph.D. and 14 master’s degree programs to the outstanding 26 doctoral, 11 masters and four professional master’s programs from which you are graduating today! You, as all of us, are not the same as you were when you entered Graduate School, nor is the world the same. Those years encompass difficult years for the world — mass shootings in the U.S., child abductions in Nigeria, typhoons, earthquakes, meteorites landing in Russia, and the Ebola and Zika outbreaks. But you’ve also witnessed hope — a successful landing on Mars achieved by the U.S., a landing on the moon by China, election of Pope Francis and renewed U.S.-Cuba relations. You are going out into a world full of wonder and need — and YOU will make a difference. Today, you are new graduates. You have your own challenges and they are truly global. In the 1960s, I was one of the first scientists to develop software to analyze bacteriological data, writing the first program to identify marine bacteria. Fast forward, and by the 1970s, my computational tools to study biology played a major role in establishing the field of bioinformatics, a key area of scientific research today. Fast forward again, to 1998, when President Clinton appointed me director of the NSF. I’d come quite a long way from the young woman denied that fellowship. 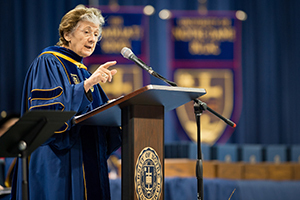 I tell you this to share with you how far you can go with your passion, your splendid Notre Dame education, and the degrees you have earned. You are on the edge of a lifetime of adventure; on the brink of discoveries that will change the world; the promise of an exciting future. You are young men and women who have persevered. Who will make the world a better place, for all of us. In our science and technology world of ever-increasing complexity, there is an intense need for knowledge and expertise. To live in harmony, we must build a sustainable future, and we must learn to understand our world as a complex ecosystem. We must use the tools of all disciplines, but in an interconnected, interdisciplinary way that establishes order in what is seemingly a disordered world. You are living in a “golden era” of scientific discovery, where breakthroughs are occurring almost daily and virtually in every field, from astronomy to material science to genetics to engineering. Moreover, today’s research moves so seamlessly into applications that it is sometimes difficult to notice the transition. Across the science and engineering enterprise, boundaries are increasingly blurring between and among disciplines, especially in the disciplines of information technology, nanotechnology and the many areas embracing biocomplexity. This is true also for the social and behavior sciences in this era of “big data,” when computational capacity reaches beyond imagination. The most exciting areas are in these “blurred connections” between and among disciplines where knowledge in one field answers questions in another. Human health and medicine have, without question, benefited from advances in molecular biology, fundamental chemistry, physics and mathematics, but a new frontier in scientific exploration provides the next major advance for the health sciences, namely the integration of the ecological sciences, conservation biology, systems engineering, brain science and medicine. Ecosystems analyses are proving insightful. Most striking is merging of what were considered disparate data bases and rendering these integrated, through advances in information science and technology. Very large data sets accumulated by ecologists, toxicologists, public health scientists, climatologists and atmospheric scientists are now being merged and mined to yield new understanding and discovery of fundamental principles of human health previously unrecognized. And most fortunately, these advances are being made at a time when they can be used to solve the most pressing problems facing human civilization: poverty, climate change and strife among nations. We are a “world neighborhood” of seven billion people, most of whom are disadvantaged. Yet the poorest of the poor still maintain hope for the future. We will need leaders of vision who can find ways to realize that hope. I cannot predict the future, but I can see the trends. We will need citizens literate in both science and the humanities and articulate and ethical leaders, with good judgment, who can navigate an increasingly complex world. Do not forget the lessons you have learned here at Notre Dame. I’m sure you will reflect on some of those lessons, but I will let you in on a little secret: The truth is, you don’t yet know which of those lessons will prove to be the most important, the most enduring. You can’t know — not yet. You may not know until many years in the future, when you have the chance to think back on your university days. You will be surprised which lessons proved to be the most significant and influential . This commencement is the beginning of your own personal … and collective … lifelong journey in learning and in changing the world to become ever better, more sustainable and more peaceful. And, in that journey, be curious, be studious, be compassionate and be committed. You will not lack for challenges, for excitement or for gratification, and I know that you can change our world. Enjoy this day with all your heart and soul. You have earned it! Congratulations and great good luck! Originally published by Notre Dame News at news.nd.edu on May 14, 2016.